Each year in January, Palau International Coral Reef Center (PICRC) invites students from all over Palau to join their anniversary celebrations. This year, PICRC was joined by partners: Palau Conservation Society (PCS), Coral Reef Research Foundation (CRRF), Palau National Marine Sanctuary (PNMS) Office, Division of Marine Law, and Belau Watershed Alliance (BWA). From January 9 to January 11, PICRC and partners hosted an Education Carnival to celebrate and educate. During the carnival, students learned about fisheries, freshwater conservation, marine pollution, and what it means to “Build a Strong Foundation for a Resilient Future”, the theme for PICRC’s 18th Anniversary. 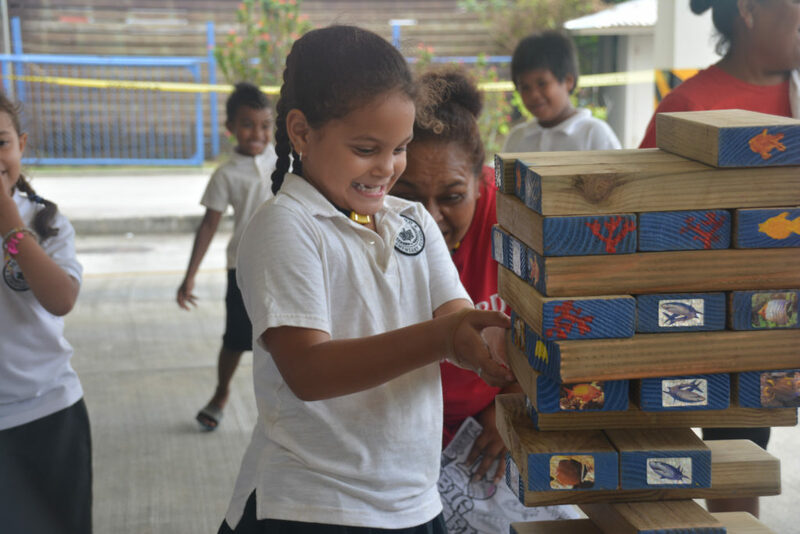 During the carnival, PICRC explained the anniversary theme through a game of Giant Jenga. The Giant Jenga set represented our ocean and each block represented a different marine resource. As more resources (or blocks) were taken from the ocean (or Jenga set) it became more unbalanced, eventually crumbling. The activity illustrated the importance of protecting our resources so they are available for future generations. PICRC’s partners also prepared many engaging activities for the students. PCS taught students about sustainable fishing methods through an interactive fishing game. CRRF demonstrated how they track the amount of rainfall in marine lakes and what happens to the lakes during time of drought. PNMS created a trivia game that quizzed students on the Sanctuary and the benefits that it will provide. They also played fishing games to teach students why it’s important to release fish that have not fully matured. The Division of Marine Law explained their role in protecting Palau’s open ocean through surveillance and BWA taught students about the importance of water conservation with a boardgame centered around reducing water consumption. This year, PICRC’s Education Carnival reached an all-time high. Within three days, over 550 students from Melekeok, Aimeliik, Ngaraard, Meyuns, and George B. Harris Elementary Schools, as well as Belau Modekngei School and Palau High Schools visited the Center. Encouraging Palau’s youth to be environmental stewards is just one way we can continue to strengthen the foundation that our ancestors built for us.